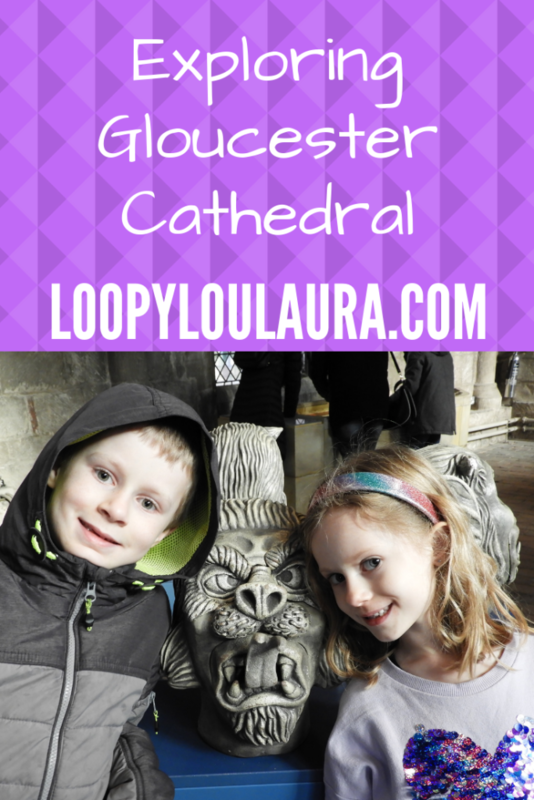 Exploring Gloucester Cathedral: blogger meet up! I love blogging events and jumped at the chance to go along to Gloucester Cathedral at the weekend to meet up with fellow bloggers, spend time with my family and enjoy the fantastic sights and history of the venue. 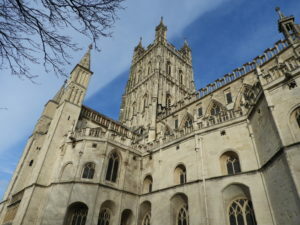 I have family in Gloucester but haven’t been to the cathedral before! As we arrived, I met up with Mary and her son from Over 40 and a Mum to One who I feel I know as we have both taken part in #Project365 (check out the blog hop for our latest posts). Inside we met up with Afra from Mad Mum of 7 who I first met at a McDonalds event. 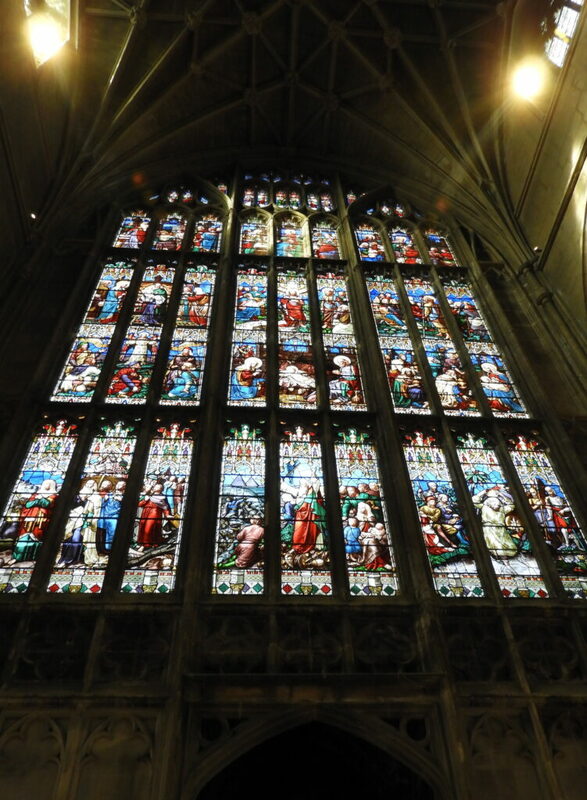 We were treated to a tour of the cathedral and I was really proud but also quite surprised at how many history and Harry Potter questions Matthew could answer! 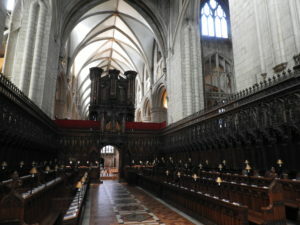 The cathedral was originally an abbey, home to monks until the Reformation. 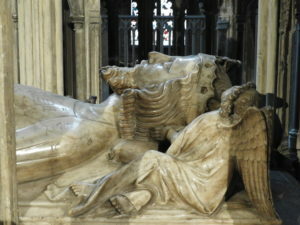 It would have been destroyed like so many other religious buildings but for the fact that King Edward II is buried inside. 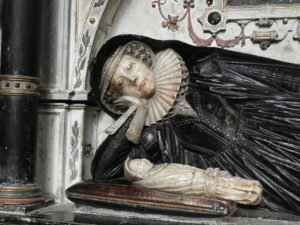 The eldest son of William the Conqueror is also buried here. John Hooper, Bishop of Gloucester was burned at the stake on the orders of Mary I exactly 464 years ago (I’m a little sad there was no recognition of this as it was the actual anniversary on the day we visited). 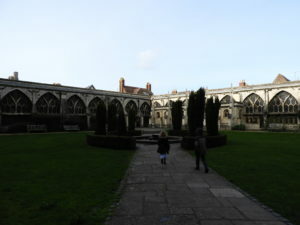 More up to date were the tour guide’s descriptions and detail about the Harry Potter filming, pointing out precise locations for numerous scenes and describing how the cathedral was transformed into Hogwarts. 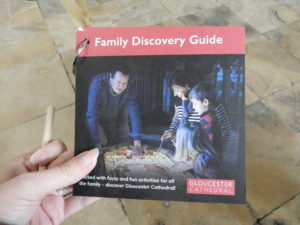 We had a break for lunch and then were given a discovery trail booklet to explore the cathedral on our own, searching out tiny details and looking in more depth. 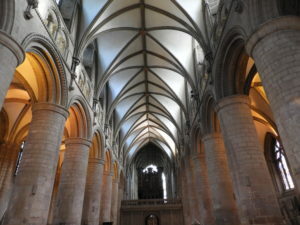 The trail takes a flowing direction around the cathedral and includes a map as well as activities, pictures and textiles to inspire discussion. 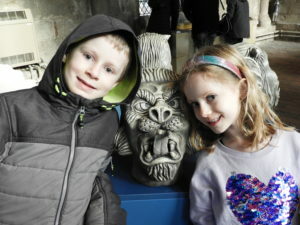 In the upstairs gallery there are lots of activities for children to get involved with and Matthew and Anya loved making their own gargoyles whilst Zach moved blocks around using a crane. 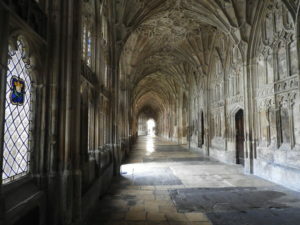 It really was a lovely event and appealed to the HarryPotter fan as well as the history buff. 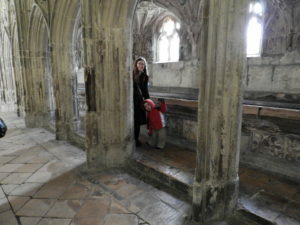 Gloucester Cathedral was simply stunning and the trail made it interactive for the whole family. That looks fantastic. Definitely somewhere I could photograph. 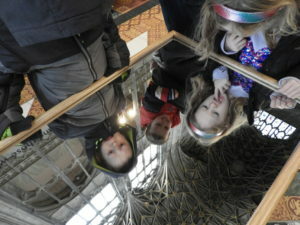 Thanks for sharing your visit and the great pictures. 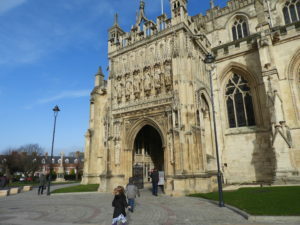 I’ve never visited Gloucester cathedral and it’s not that far from me. I really should make an effort, it looks like you had a great day. WOW! The cathedral looks amazing! 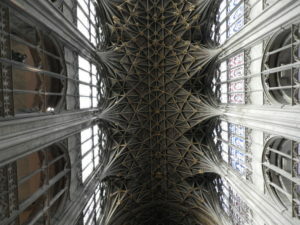 I almost mistook the photos for Salisbury Cathedral. They kinda look alike!! How beautiful. This is certainly a sacred space. 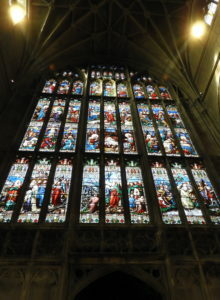 I have seen great cathedrals in Europe, but we have nothing like it in the US. What a wonderful education for your children!